With all of the mobile camera apps out there helping you shoot great photos, it was only a matter of time before Newton’s third law of motion came into play — at least in modified form. There are now a number of iPhone apps that specialize in helping you delete photos you don’t want. 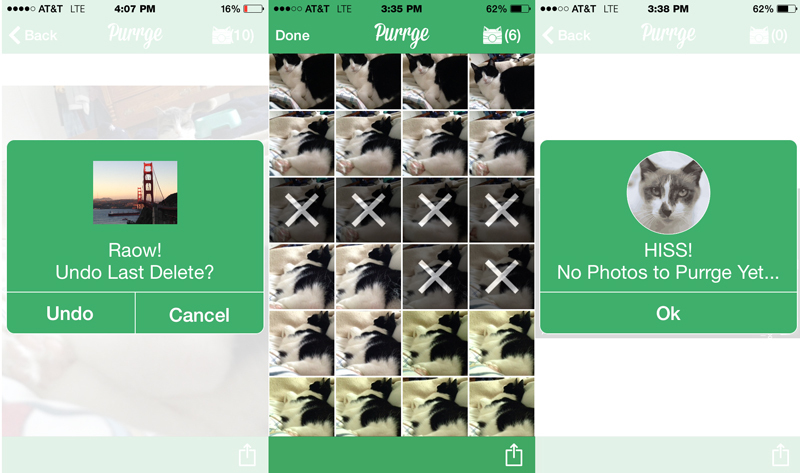 The newest entry, released today, is Purrge, a cat-themed competitor to the likes of Flic (a recent Tinder takeoff) and Cleen, a free app that does roughly the same thing: Help you discard unwanted photos with a swipe gesture. Purrge, a photo manager optimized for both the iPhone and the iPad for iOS 8, offers an assortment of swipe options: back and forth between photos, across to select multiple photos at once or up to remove a single photo. Purrge differs slightly from other similar apps. While Apple’s Album photo grid lets you select multiple photos one-by one and its Collections view lets you batch select Moments, Purrge lets you swipe (in feline fashion) across multiple photos anywhere in the grid to quickly delete rejects. If you have no photos at all (how can that be?) a snarky little puss named Ricky appears to congratulate you, says the developer. If you haven’t deleted any photos but try tapping the purrge icon, you get a hiss alert. 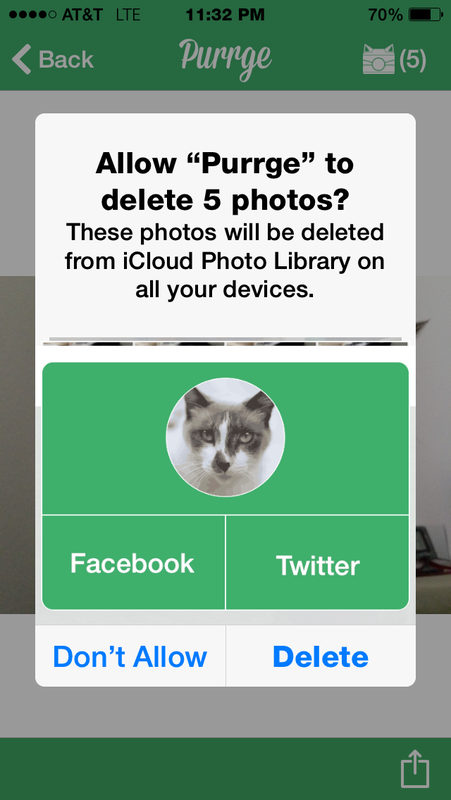 A “tell your friends” feature automatically records the total number of photos removed from your device with the app. Coming soon is the ability to specifically delete photo bursts, videos and entire albums. While the Purrge description may imply that space is immediately freed up as soon as you remove photos with the app, that’s not quite the case. When you hit the Purrge button, those pictures go from the All Photos folder to the Recently Deleted folder, just as if you had used Apple’s native Photos utility. There, they will sit for 30 days or until you manually delete them. Purrge is available for 99 cents until the end of January and then the price goes up to $1.99. It operates on all iPhones from the 4s and newer.